The term legend is bandied about rather too freely when supporters fondly recall their favourite player, but few actually truly deserve the accolade. William Randolph Fenwick, however is one such person who does. Born on Friday 13th August 1920 in Shotley Bridge County Durham, Billy Fenwick was destined to a life truly dedicated to football and especially to a club in a Northumberland town he had no recollection of moving too, the move as a 2-year-old was down to his father being signed by their football club. The youngest son of Alfred Randolph Fenwick, Billy’s father was a former Hull City, West Ham & Coventry City defender. Alfred had given up full-time professional football and returned to County Durham to work in the thriving local mines and played for Leadgate Park in the North Eastern League. In 1922 Billy’s father was transferred from Leadgate Park FC to Blyth Spartans and he took up at job at the Isabella Pit, the Fenwick family moved to Blyth after they were given help by the club to find a new house in Tenth Avenue, Blyth. From the day his father was signed by the Spartans a love affair was born that to this day still draws 92-year-old Billy to Croft Park to watch ‘his’ club. From an early age Billy became a Spartans supporter being carried into Croft Park on his father’s shoulders or even wheeled in through the players gate in his pram!. Even after his father’s playing days ended Billy continued to watch his beloved Spartans through his school days at Princess Louise Road Infants, Newsham Junior & New Delaval Senior schools. Coming from a family very much involved in football, it was always clear that young Billy himself would also play some role in the game, aside from his father Billy’s late brother, Alfred Leslie Fenwick (who also played for the Spartans) signed for Sheffield Wednesday in 1934, before joining Reading in 1938, after his playing career came to an end he carved out a successful coaching career in Holland and Norway. Billy’s cousin, Austen Fenwick Campbell, played for Blackburn Rovers and Huddersfield Town and was capped 8 games for England, (being on the winning side 7 of these 8 games), whilst another cousin was the famous disciplinarian footballer & Manager Alan Brown, who twice managed Sunderland, along with Sheffield Wednesday and Burnley!. With the game running through the Fenwick family blood it came as no surprise that a young Billy was recognised as a good footballer in his early teens, playing for his school team and also Blyth Boys and after he left school. While playing in the Miners Welfare League for South Newsham Villa and then Bates Welfare his performances began attracting the attentions of many League scouts however fully aware of him & his pedigree the Spartans took in most games he played watching his development. Billy’s hometown club thought they had stolen a march on the League clubs in 1937 when newly appointed Secretary/Manager Ernie Hoffman signed the promising 17-year-old. However, shortly afterwards without Billy having played a game for the Spartans, Sheffield Wednesday used a family connection in his elder brother Alfred Leslie who was already playing for them, to finally sign the promising 17-year-old forward just a week after his birthday. Sheffield Wednesday had wanted to sign Billy a year earlier, however at the tender age of 16, his father would not let him leave home believing he was too young. The Yorkshire club were determined to get their man and tried again a year later, this time they were successful partly only due to his father insisting he only went part-time and that he continued to learn his trade as a plasterer whilst he was pursuing a football career in Sheffield. Whilst this was sound parental advice and should be given to many young footballers today, it could be argued that on this occasion it possibly went against Billy having a career in top flight football. Sheffield Wednesday manager Billy Walker agreed to these terms and he signed for the princely sum of less than £3 per week, with the promise of a small win bonus! However, before joining Wednesday the club had been relegated to the 2nd Division along with Manchester United, the under pressure Walker resigned in November 1937. Into Hillsborough came former legendary Man City player Jimmy McMullen. The following season 1938/39, the Scot cleared out all players who were not on full-time contracts and young Billy Fenwick was homeward bound! Billy still has fond memories of his time at Wednesday, even though his stay was not as long as he would have wished, one of his fondest memories is a real throw back in time. In Billy’s era of heavy leather football boots, a world away from the flimsy things worn today, apprentices were famously been given the job of cleaning senior/first team players boots however he was given a slightly different boot related task. Bill recalls how the boots took hours of wear to ‘break-in’ but once broken in they were actually comfortable to play in. To his surprise March 1938 Billy was given a brand new pair of boots by the club, rather pleased with his new boots he wore them in until they became comfortable. However unknown to him there was a reason he was given the boots, once the boots had been broken in and were comfy to wear, he was then asked to hand them over to Wednesday’s inside forward George Dury before his £7,000 transfer to Arsenal!. 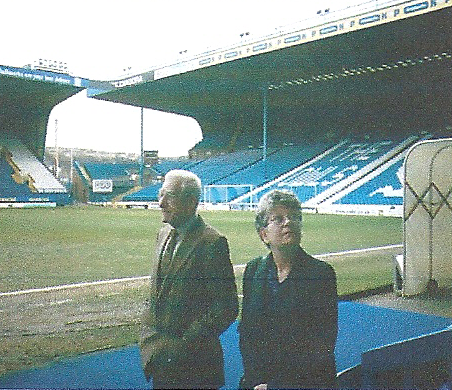 Billy was invited to return to Sheffield Wednesday for a VIP Day on the 5th March 2003, accompanied by his daughter Jacqueline and her partner Colin Brown; they were all given a guided tour of the Hillsborough Stadium and facilities, which had undergone a massive change since Billy was last there in 1938! 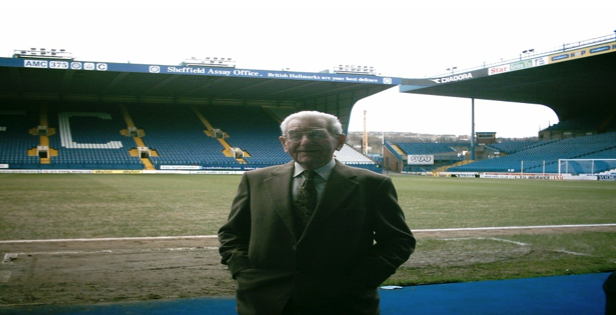 Walking around the Hillsborough Ground and into the Players Tunnel after 66 years it brought back fond memories and also tearful memories of his spell at a club, both he and his brother Alfred Leslie had played!. During the visit after they all enjoyed lunch in the Directors Room, Billy was presented with gifts from the club, and needless to say photographs were taking of his VIP Day!. It was a superb thing for the Sheffield club to do for Billy and one day he’ll never forget. Papers report on Billy playing for Reserves. Billy returned home to Blyth and played several times for the Spartans Reserves in the Northern Alliance during the 1938/39 Season, however, an ankle injury forced him to miss several games!. In 1939, the outbreak of World War II put a further stop on Billy’s football career and with their being little or no work back in Blyth for a plasterer at that time Billy volunteered. He joined the Royal Air Force and after completing his training, Leading Aircraftsman Fenwick set sail for India in 1941 spending his 21st Birthday at sea, once in India he was based in Karachi. Whilst serving so far from home Billy really missed home life, his family and his girlfriend Lil so took he took any & every opportunity to write home to them, however it was his skills developed at home that made him an integral part of the RAF’s activities in India. 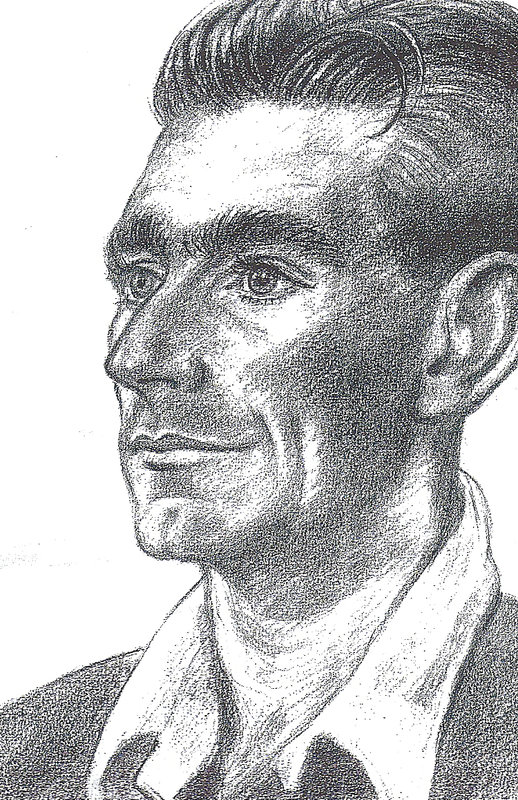 Pencil sketch of Billy by one of his colleagues while serving in India. Because of Billy’s football skills, he was chosen to play captain his RAF station’s team for 3 years!. Billy’s still has fond memories of these games and his teammates such as Manchester United’s Outside Forward Billy Wrigglesworth, there were several other professional footballers so being chosen as captain was an honour for Billy. Upon demobilisation in 1945, Billy returned home to marry his fiancé Lil, at Horton Church and have now clocked up 68 years of happiness together. 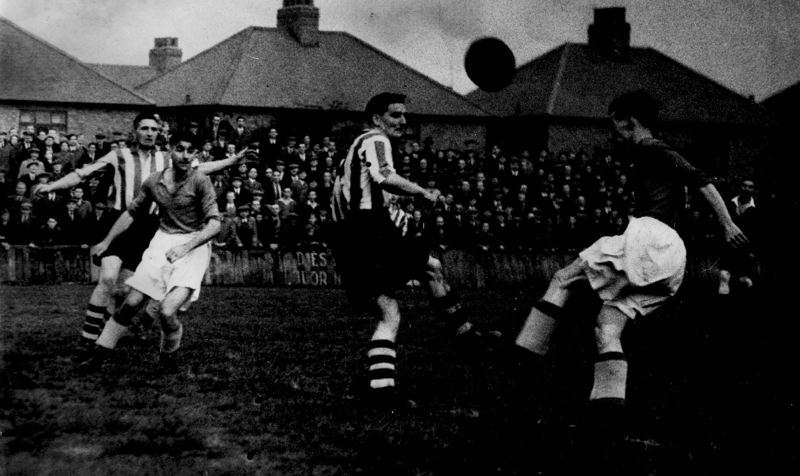 Blyth Spartans like many other teams closed down at the outbreak of the War in 1939 and did begin again until September 1946 playing in the Northern Alliance. 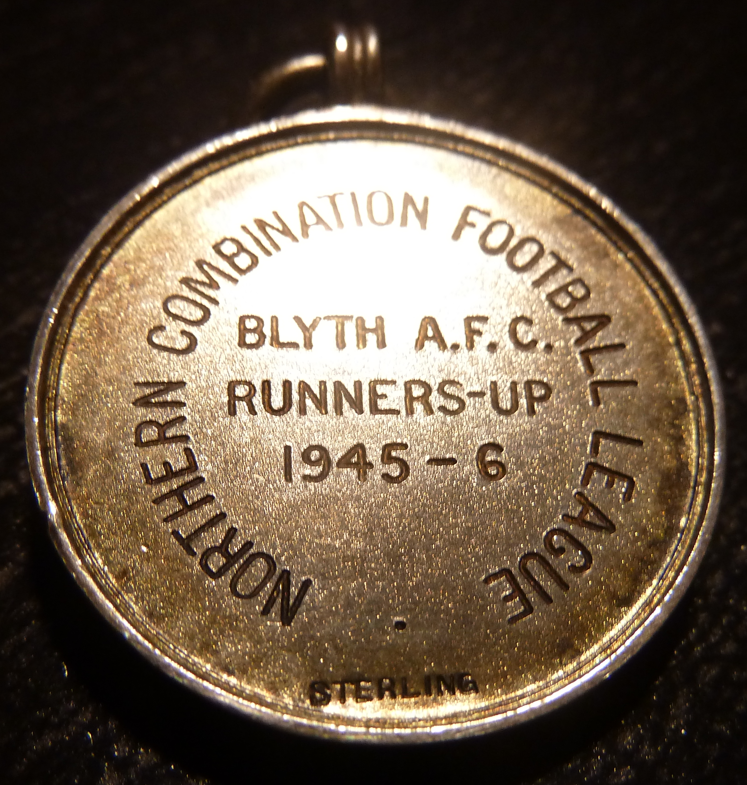 At the start of the 1945/46 Season, Billy joined Blyth Shipyard FC, a team that had been made up of workers from shipyard, they were playing in the Northern Combination Football League. Another well-known Spartans Legend, Jimmy Turney, (later to become a manager and chairman of Blyth Spartans), also played several games for the Shipyard team, before his move to Blackhall and signing professional for Darlington, before joining Blyth Spartans in 1950/51 season. The team named Blyth Shipyard, later changed to Blyth FC and then in September 1946 they became Blyth Spartans. 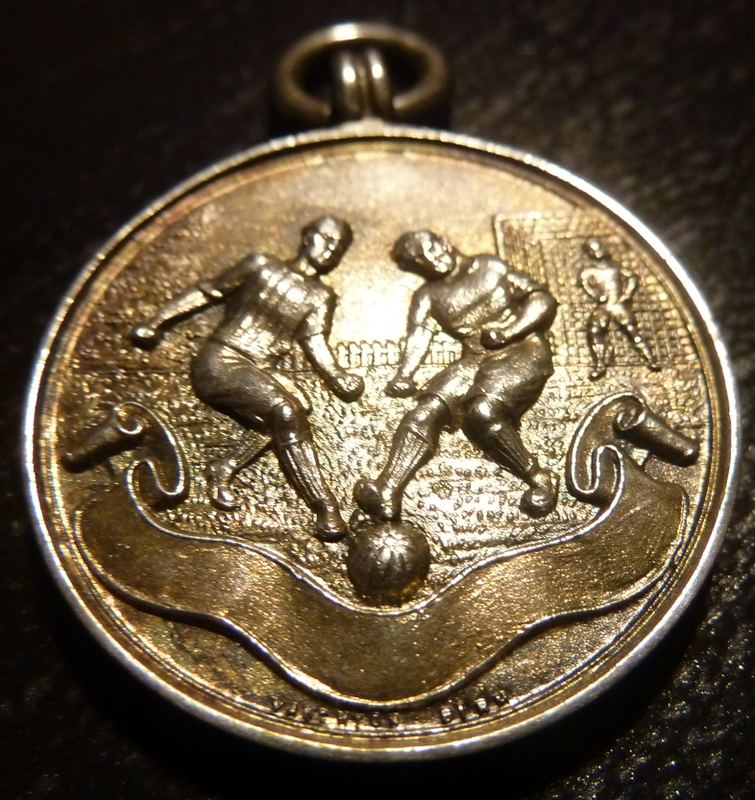 Billy won 2 medals with this team, as they finished 2nd in the Northern Combination League, and they won the League Challenge Cup they were also Runner’s Up in the Northumberland Senior Cup losing 0-3 to Newburn at St James Park, Newcastle, but no medals were given to the runners-up! During 1946, Billy’s skills were once again attracting the attentions of League scouts and he was offered the chance to join Blackburn Rovers. He went to Blackburn for a week and actually represented Blackburn Rovers in a Central League Match against Burnley FC, alongside two ex-Spartans players, goalkeeper Jim Barron and wing-half Eric Bell, Eric had signed for Rovers from the Blyth Shipyard team in 1946 and went on to play 323 times for Rovers before retiring in 1957. As to be expected Billy impressed Blackburn manager Eddie Hapgood and he offered him a contract, (one of the several Burnley first XI players in that game was Billy’s good friend from his time in India, Fred Taylor). However, Billy and his wife Lil were expecting the birth of their only child Jacqueline and as Bill had settled into a steady job as a plasterer with Blyth Council, he also knew there was a chance to play for Blyth Spartans when they re-start in September, so they both agreed the time was not right to move away from Blyth. In 1946/47 Billy’s father, Alfred Fenwick had become a Board Member, after seeking FA approval for ex-professional players to be a Board Member of Non-League Clubs when the Spartans recommenced after the war. 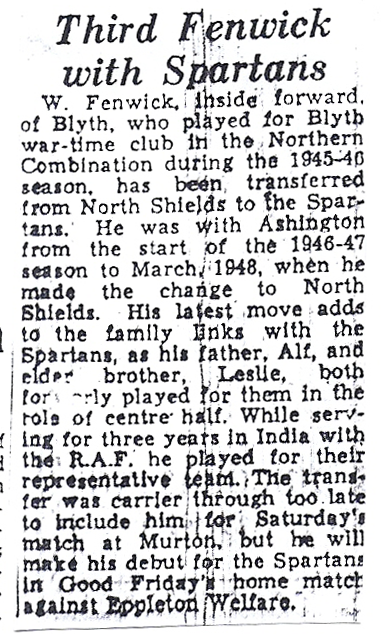 After failing to be elected into the North Eastern League, Blyth Spartans joined the Northern Alliance in the Season 1946/47, they signed 38 players many of them from the former Blyth Shipyard team players, however surprisingly Billy was not among the 38!. Billy was wasn’t short of offers and signed as a professional for Ashington, they were already in the North Eastern League, where he had a very successful season scoring & creating goals as they finished 9th. 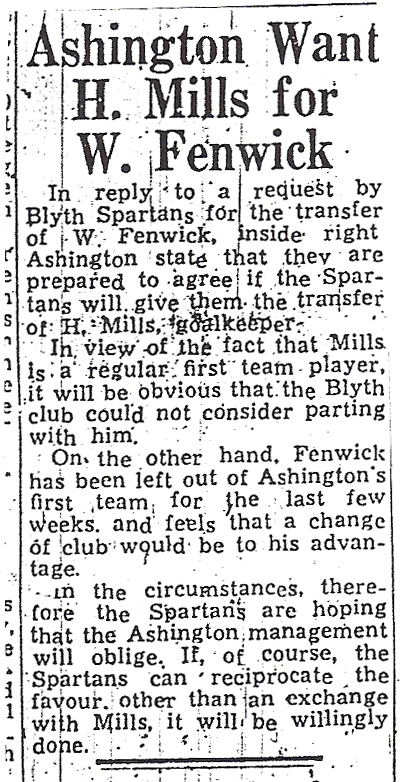 In December 1947, Blyth Spartans wanted Billy back at Croft Park and contacted Ashington FC with the intention of trying to sign him, Ashington made it known they were ready to do business. needless to say the move didn’t happen. This was shortly before the legendary goalkeeper left Blyth to sign for Huddersfield Town, where he was to go on a make 157 appearances for the Division One club. The Colliers placed Billy on the transfer list in January after he became ‘dissatisfied’ after being left out of the team, in February 1948 he was transferred to fellow North Eastern League side North Shields and went on to make 15 appearances scoring 4 goals. North Shields were keen to sign Billy having seen him at first hand in the 3 game FA Cup meeting with Ashington in the previous season’s 4th Qualifying Round, which the Robins eventually won 3-1 after two 1-1 draws. 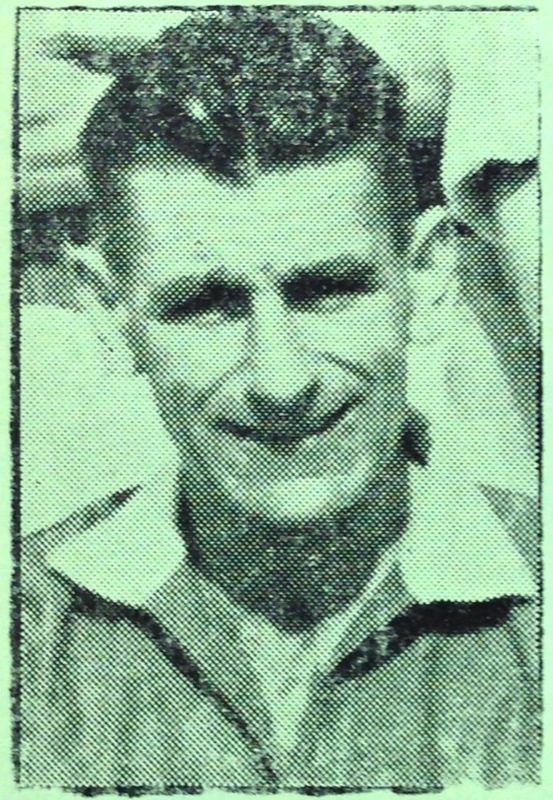 Billy enjoyed his 2½ seasons at North Shields, in his 1st season they finished a rather surprising 15th place but bounced back to win the North Eastern League title in 1949/50, when Billy was top-scorer with 21 goals, however Billy’s hometown club got Shields home campaign off to a poor start as the Spartans won 4-1 at Appleby Park on 24th August 1949. 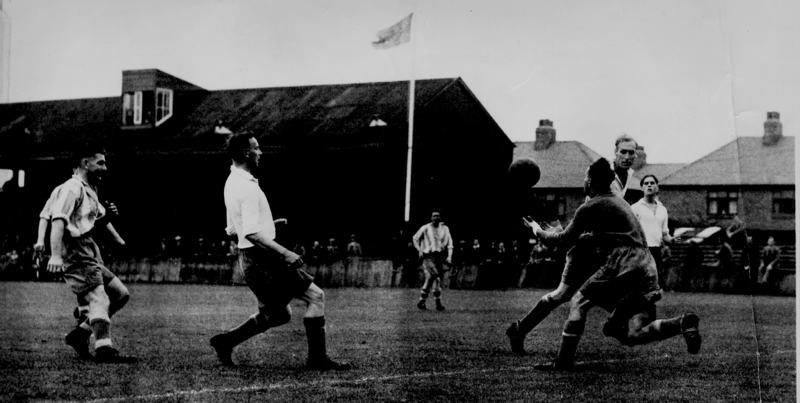 Billy (2nd from left) in action for North Shields at Croft Park. Revenge was gained on 29th October when the clubs meet at Croft Park in an FA Cup 3rd Qualifying Round tie as Billy scored in a convincing 5-1 victory for the Robins. The Spartans continued to show a keen interest in bringing Billy ‘home’ and halfway through the 1950/51 season North Shields were approached about a possible transfer, initially reluctant to allow him to leave it took until the March 1951 for the Spartans to get their man again. 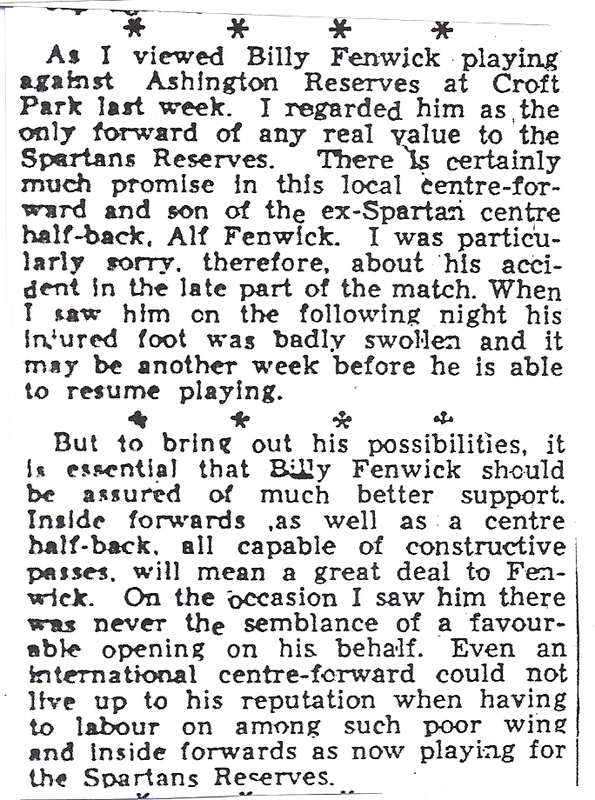 Blyth News report on Billy’s return to the Spartans. Having thoroughly enjoyed his time in a successful North Shields team making 122 appearances & scored 33 goals, Billy was delighted to once again return to what he still to this day calls ‘his club’. His return home debut on 23rd March 1951 couldn’t have personally gone any better as he scored a hat-trick in a 4-4 draw against Eppleton Colliery Welfare, the Blyth side that day was: Clough, Sowden, Nichol, Thompson, Allison, McLachlan, Harvey, Billy Fenwick, J.A Turney, White, Ross. His 1st full season back, 1951/52, was an epic & unique one as Billy entered the Blyth Spartans history books, he scored 17 goals to finish joint top scorer along with his good friend Jim Turney but like many other Spartans it was the FA Cup that sealed his place in history. Only twice in the history of the club’s history has an FA Cup tie taken 4 games to be decided and remarkably with 26 years apart both ties featured a Fenwick, in father and son Alfred & Billy, both were involved in all 4 games on both occasions and they both scored in the games! The famed cup fighters reached the FA Cup 2nd Round and were drawn away to Tranmere Rovers. Wing half Norman Penrose scored Blyth’s goal in a 1-1 draw at Prenton Park, the Blyth side that day was Middleton, Sowden, Sharp, Penrose, Allison, McLachlan, Scott, J.A.Turney, Billy Fenwick, F. Turney, Gair. The replay at Croft Park also ended 1-1 and went to extra time but had to be abandoned 15 minutes into it due to bad weather. The replayed game was staged at Brunton Park, Carlisle and a 3,202 crowd saw Billy get on the score sheet as once again the sides played out a draw, this time 2-2 after extra time. The 4th game, played at Goodison Park, Everton saw the league team prove too strong winning 5-1 as Blyth suffered several injuries during the game as well as missing influential defender Arthur Sowden, despite the outcome these game are Billy’s greatest & proudest moments as Blyth player, however when recalling that game Billy always mentions that the Blyth team had suffered from stomach upsets earlier and during the game. Billy’s father Alfred, played in the 1925/26 games when Blyth took Football League 3rd Division North side Hartlepools United to 4 games. After a 2-2 draw at Croft Park then the replay ended 1-1 after extra time. The 2nd replay was staged at St James Park and also ended 1-1 after extra time the 3rd replay this was played at Roker Park and Alfred scored in the 2-1 win for Blyth that sealed an away tie at Football League 3rd Division North side Accrington Stanley. Alfred had also starred in Blyth’s 1922/23 Cup run that saw them play Football League 3rd Division South club Gillingham away in a 6th Qualifying Round tie. He scored twice in a famous 4-1 victory that set up at 1st Round tie with Football League 1st Division side Stoke at Croft Park, a 9,121 crowd saw Blyth hold their own for 45 minutes ended the first half 0-0 but the professionals second half fitness proved too much running out 0-3 winners. Billy in action during a pre-season trial game, which was a Probable XI playing a Possibles XI. 1952/53 season saw Billy once again scoring 17 goals as Blyth finished 4th in the North Eastern League, however the following season was a disappointing one as Blyth finished 14th the lowest placing in the 17 season Blyth played in the single league Northern Eastern League with Billy only scoring twice. 1954/55 season was to prove Billy’s last with the club, in a campaign ravaged by injury he only managed 1 goal in a 7-3 victory over Hartlepools Reserves at Croft Park on 18th September 1954. Towards the of the season Billy moved to North Eastern League side Cramlington Welfare but he suffered further injuries to his troublesome knees and had to call an end to his illustrious playing career. 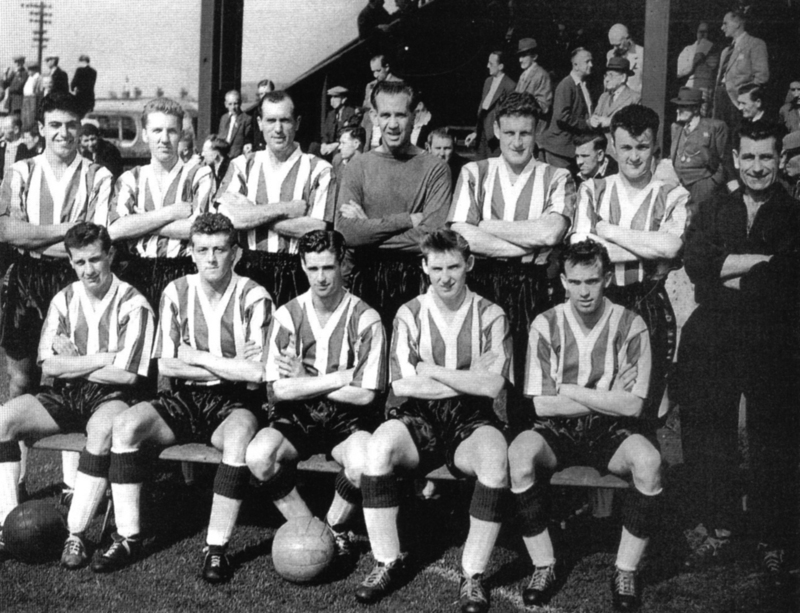 Trainer Billy with the 1958/59 Blyth team that played in the Midland League. 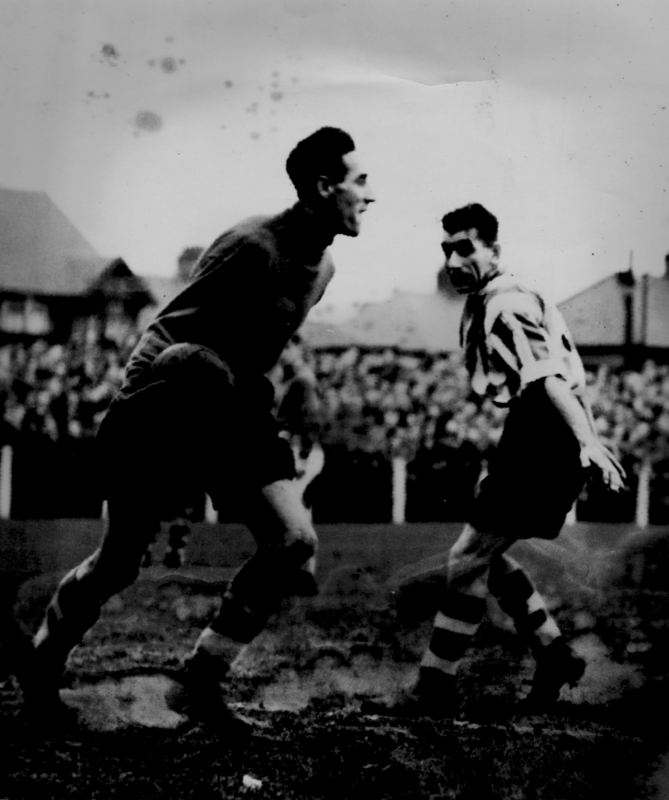 Following his retirement through injury, his friend Jim Turney brought Billy back to Croft Park in June 1957. He took up the role as Trainer, a role Billy held for several years, he also changed jobs and took up employment as a Plasterer with Jim’s own family building firm, Turney-Wilde, this suited the time off he required to travel to away matches!. While Billy’s actual playing career with the Spartans was interrupted by the War & spells at other local clubs it was his many hours & years of unpaid work behind the scenes that carried on his families love affair with the club. From his father playing & being a board member to him and his elder brother playing it is a family affiliation with a club that spans an amazing 93 years. As well as being trainer, Billy also carried out various other roles at the club such as kit man he was a board member for many years and even managed the Spartans for a short period. Within & around Croft Park he carried out many duties including painting, plastering and was always the person to start clearing the snow from the pitch when required, he even darned socks to save the Spartans money!. One abiding memory Billy has from his playing days of Croft Park was the dressing rooms in the old stand having what he thought was “the coldest water in England”. Billy and friends (LtoR – George Watson, Johnny Evans, Mickey Lister, Ronnie Phillipson, Eddie Alder, Gordon Atkinson & Jackie Marks). Too gracious to pick out a favourite player from his many years serving the club, he speaks highly of the likes of Arthur Sowden, Harry Mills, Michael Hind, Eddie Alder, John Evans, Peter Flaherty, Mickey Pink, Ronnie Scott, Jackie Marks, Dave Clarke, Neil Hetherington and Micky Lister!. As a mark of the man, of the many players Billy played alongside, trained, managed and even darned sock for he classes them all as friends and still enjoys nothing better than when they meet up to take in Blyth games, which they often do and of course are rightly treated as guests of honour by ‘their’ club. A proud life member and Freeman of Blyth Spartans AFC he has seen many changes over the years the ground has been transformed beyond recognition for the ground he played in. The club fortunes have changed, he’s been ‘involved’ off the field in some epic cup runs including the famous run like reaching the FA Cup 5th Round Replay in 1977/78, however the recent 2008/09 FA Cup run brought him particular personal pleasure. Hosting a Premiership side live on TV at Croft Park was a massive achievement for the club, the opposition Blackburn Rovers was to Billy, perfection. With his cousin Austen having played for them in 1935 and Billy having been offered a professional contract by them in 1946, it was poetic that they should come to ‘his club’ in what was one of ‘his’ club’s most memorable ever nights. The unassuming person he is, Billy proudly took up his usual seat in the main stand as if it was another game making no fuss of the significance. William Randolph Fenwick loved his time at Blyth Spartans, its obvious to all who know him. That at the age of 92 he still sits in the Port of Blyth Stand watching every home game shows what the club has meant to him and his family over the years, he is the oldest surviving Blyth Spartans player, a record we all hope he continues to hold for many more happy and healthy years! Billy Fenwick…….a genuine living legend. To the great man himself, Billy was more than willing to recount his life for this article in his honour. Colin Brown, partner of Bill’s daughter Jacqueline, and lifelong friend of Billy who did a great deal of the research at Blyth Library and most of the ground work with Billy. 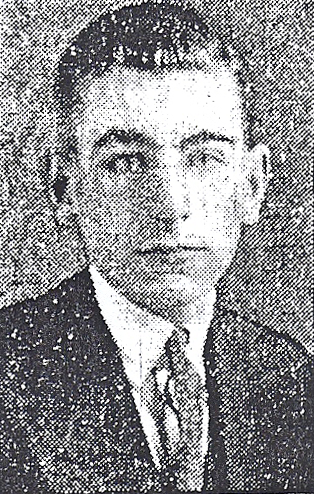 Ritchie Bonass, who provided images of his grandad. Ken Sproat, who provided important information on the history of Blyth Spartans AFC. Kevin Tilmouth, (who suggested featuring Billy in the Cult Heroes series) provided vital info & images. Alan Matthews, Chariman of North Shields AFC, who supplied vital information. This entry was posted in Green & White Cult Heroes, Players, Uncategorized and tagged Alan Brown, Alfed Randolph Fenwick, Alfred Leslie Fenwick, Ashngton FC, Austen Fenwick Campbell, Billy Fenwick, Billy Walker, Blackburn Rovers, Blyth FC, Blyth Shipyard FC, Blyth Spartans AFC, Croft Park, Ernie Hoffman, FA Cup, Hillsborough, Hull City, Jimmy McMullen, Jimmy Turney, Leadgate Park, North Eastern League, North Shields FC, Northern Alliance, RAF, Sheffield Wednesday, St James Park, The Wharncliffe Charity Cup, Tramere Rovers, William Randolph Fenwick. Bookmark the permalink. 4 Responses to Green & White Cult Heroes – Billy Fenwick…. a living legend.